Measuring the temperature of reflective metals is a challenge. Reflective surfaces, hot furnaces and high ambient temperatures can make it difficult to achieve accurate results with non-contact sensors. The new FibreMini fibre-optic pyrometer from Calex has innovative features that are specialised for accurate measurements in this industry. Have you ever tried to measure the surface temperature of shiny metal using a handheld IR thermometer? You might have seen that changing the measurement angle affected the reading, or that it was difficult to make the thermometer display a believable temperature, especially when aiming it into a furnace. General-purpose, long-wavelength temperature guns are not suitable for use on metals because they are more susceptible to errors than short-wavelength sensors if the emissivity setting is incorrect. A small error in the emissivity setting can cause a big error in the measurement. Add to this the problem that the area surrounding the furnace is a harsh place to mount an infrared temperature sensor, with the ambient temperature commonly exceeding 100°C, and you have a very challenging application that rules out most choices of sensor. Fibre optic sensing head withstands up to 200°C ambient temperature, making it ideal for mounting near furnaces. No electronics in the sensing head make it immune to electromagnetic interference in high-EMC applications such as induction heating. Reflected energy compensation allows for an accurate reading when measuring reflective objects inside furnaces. Simply enter the temperature of the furnace interior and the sensor will compensate for the reflections for a much more accurate reading. This can also be adjusted automatically on Modbus models for maximum accuracy during heating or cooling cycles. Laser aiming light illuminates the measurement area, showing both the location and the size of the measured spot. This makes the sensor very easy to aim. 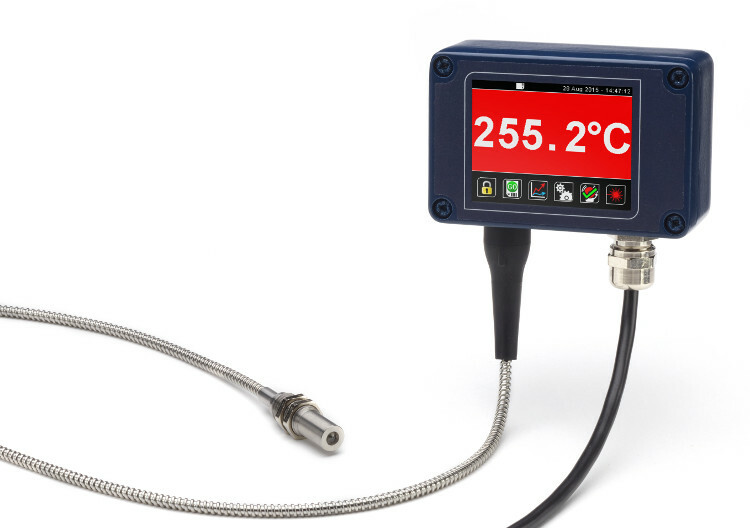 Large, full-colour temperature display with data logging makes the FibreMini a truly plug-and-play solution – simply connect a power supply and start measuring. A choice of 4-20 mA or RS485 Modbus outputs is available for connection to your process instrumentation. Fully configurable via touch screen with no need for any additional configuration hardware or software. All the above features are included as standard on every FibreMini model. A choice of temperature ranges from 250°C to 2000°C is available, as is a choice of optics for measuring small or large areas at short or long distances. Feeding the sensing head through conduit and trunking is easy, thanks to the slim, highly flexible fibre optic cable, which is available in lengths of 3, 5 or 10 metres. The short measurement wavelength allows the sensor to measure through many ordinary viewports made of glass or quartz, as well as specialist IR-transmissive materials. Caution! Measuring the temperature of non-ferrous metals, especially aluminium and copper, is extremely difficult with any IR sensor. Contact Calex for advice before attempting this. Why Use Peak or Valley Hold Processing?